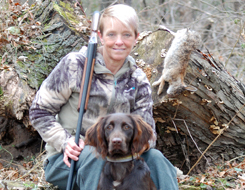 Vom Whispering Winds is a professional breeder and trainer of Deutsch Langhaar gun dogs located just east of the Twin Cities of Minneapolis and St. Paul, MN near the WI border. 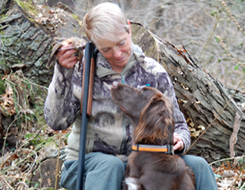 We live and train our dogs near the St. Croix River, which offers very diverse habitat for gun dog training by offering multiple training options in the fields, in the woods, and in water. 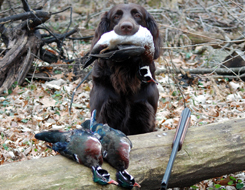 These versatile hunting dogs are proven as an excellent breed of gun dog for upland bird and waterfowl hunting, varmint/predator hunting and blood tracking of game. 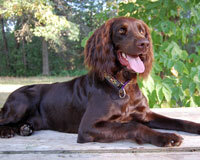 The Deutsch Langhaar, or German Longhaired Pointer, is an old breed of dog that was first mentioned back in the mid 1500's, and had its standards formally established in 1879. There are very strict standards to breeding Deutsch Langhaars to ensure the integrity of the breed, and to maintain quality blood lines to for future litters. The Deutsch Langhaar is a superior hunter, and they also make excellent family members. They are at home in the field, woods or water, as well as just laying around with their family in the house. If you have any question about Vom Whispering Winds Deutsch Langhaars, please contact us and we will answer any breeding or training questions you have. 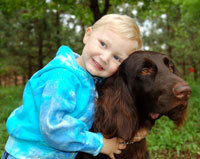 We are passionate about Deutsch Langhaars, and as a professional trainer and breeder of them, we can offer additional insight on the breed for you. Thank you for visiting Vom Whispering Winds. We look forward to meeting you and talking more in-depth about Deutsch Langhaars and our strict breeding and professional training program. 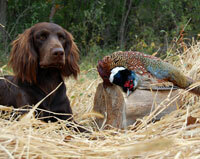 These are excellent versatile hunting and family dogs that you will enjoy owning and hunting with!